Danielle Babb’s Stories | Coffs Harbour Writers' Group Inc.
Evelyn Maud Reid, military nurse, an early feminist, fearless and compassionate, dedicated her life to the well-being of the soldiers of the Empire. She was one of ten children of Donald and Mary Reid of Puckawidgee Station on the Riverina between Conaigo and Denelinquin. Donald Reid managed the 100 thousands acres of Merino sheep station for the Curry family from 1870 to 1906. One of her siblings, Ernest Reid, a writer and poet, described the house and the games they played as children in his book “Station Stories”. “The house was standing by the bank of a lagoon on the Murray with towering gum trees in the background, small but leafy ones dotted about the homestead paddock”. Kangaroos, emus and all kinds of wildlife abounded, an ideal environment for children to grow to love the bush. He tell us about local Aboriginal children being their only playmates, about spears and tracking games, tales of bunyip and folklore that held them spellbound. She had a happy childhood, received a classical education, first at home, then boarding school. She grew up to be an independent young woman with an inquiring mind and a free spirit. There were few choices for young women of her time and station in life, either marrying, nursing or teaching. Like two of her sisters, she chose nursing and during WW1, saw action on the Western Front. Cherie recalls how Evelyn spoke passionately bout her work, her “calling” and the men she cared for. Evelyn knew of the appalling conditions in the trenches and she understood how the death of their comrades affected them, having herself lost two brothers on the same day and her sister’s fiancé. She later specialised in psychiatric nursing. She remembers her aunt telling her how she was shocked witnessing the dirigibles over the skies of London, during one of her leaves on her first stay. 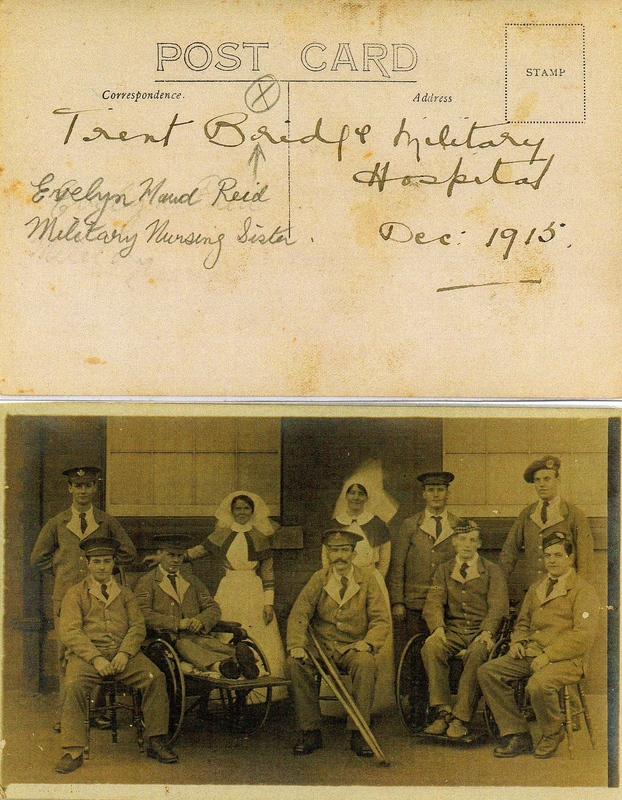 Evelyn Reid served twice on the Western Front. Whilst passing through the Panama Canal on her second journey from Australia to the battle front, she acquired a pictorial recollection of the Panama Canal, published in 1890s, documenting every stages of the build, its impact on the environment and the local San Blas Indians. She donated this wonderful book to Cherie’s grandfather in 1917. Cherie shows me photos of Evelyn throughout her life, as a trainee nurse, then as a nursing sister in her military uniform with her patients, as an older woman which she used to visit as a child. When she retired, she bought a property at Epping on two and half acres of bushland which she loved and kept intact. She left it in her will to the Eastwood RSL, for the benefit of retired soldiers. I saw this moving film recently at the Sawtell Cinema, Coffs Harbour. It tells the story of Aung San Suu Kyi, husband British Scholar Dr Michael Aris and their two sons. The story unfolds as Suu Kyi returns to Burma to attend to her dying mother when mass demonstrations for democracy started. She becomes General Secretary of the National League for Democracy (NLD) as a military coup takes control of the country, promising “fair and free” elections. Suu Kyi is placed under house arrest. Despite her detention and the arrest of other NLD leaders the party won the election in a landslide. The Junta refuses to cede power. Her husband lobbies various governments to no avail. He campaigns to get Suu the Nobel Peace Prize to raise her profile worldwide to protect her. It is one of the film’s highlights when one of her sons accepts the award on her behalf as she listens to the ceremony on radio thousands of miles away. It’s a story of devotion and human understanding, an emotional story of a family who forego their happiness for a higher cause. A story you must see. Thet Naung Soe, saw a student, unfurled a red flag with the symbol of a flying peacock, which represents students’ resistance. He was arrested, given 14 years imprisonment. U Win Tin, a journalist, former editor – the longest serving prisoner of conscience in Burma – has been imprisoned since 1989 because of his senior position in the NLD. He was released on 3 July 2012, aged 81. But while people of good will worked feverishly to free Suu Kyi and other, some profited from the vicious regime in Yangoon using political prisoners in shackles to build roads and other infrastructure. Major corporations made huge profit, Chevron and Total amongst them. Under community pressure, Telstra apologised after it became known that it purchased soft toys from the jail system for promotional sales. Extraordinary events happened recently, Suu Kyi won the vote for a seat in Parliament, her party winning 43 out of 45 contested seats making her the Leader of the Opposition in the lower house. It seems the situation is changing. The Junta is relaxing its hold on power, the country has opened its borders to foreign media, and some prisoners have been released. But is it for real? Are we rejoicing too soon? We’ll have to wait and hope. I couldn’t agree more with the remark Dr Aris made when lobbying for his wife’s nomination for the Nobel Peace prize: Hope! That’s all we’ve got!